There is still activity in the garden, even in the deep winter. We don’t have the epic snowstorms like the northeast area of the country, but we do have our share of cold. 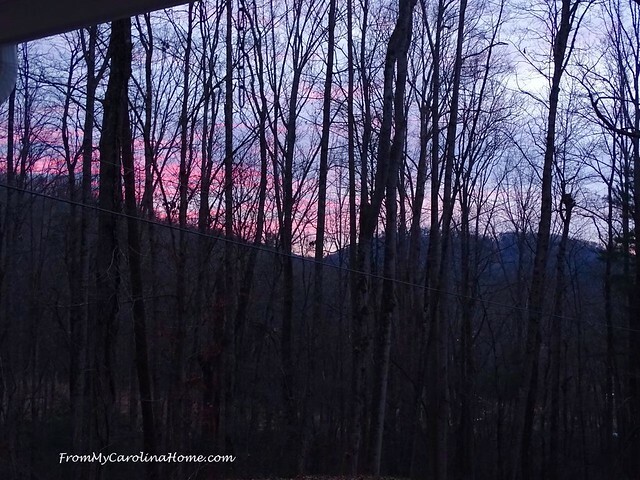 One of the joys of living in western North Carolina is the almost perfect four seasons, about three months of each. Not too cold in winter, not too hot in summer, with long spring and fall color. January has seen its share of cold days this year. 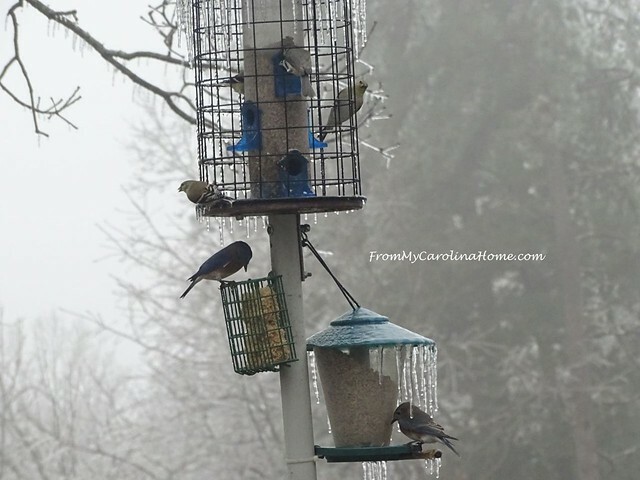 Because of the cold, a varied and colorful bird population has been at the feeder daily. 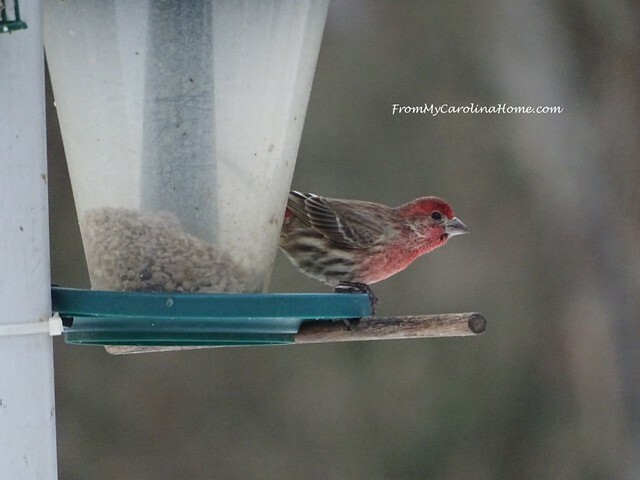 This little purple finch visits regularly for a seed meal. 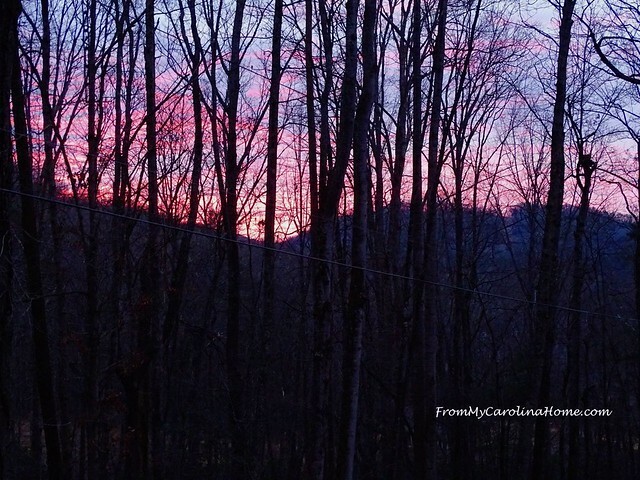 Rising early in the morning sometimes brings a beautiful view of sunrise over the mountains to the east of our property. Gorgeous this day, the pink was so intense it was difficult to photograph. Mere moments later the color was fading as the sun rose behind the mountain, the light muted by the clouds. A short time later the color was gone. Outside a bit later, I noticed this hyacinth. 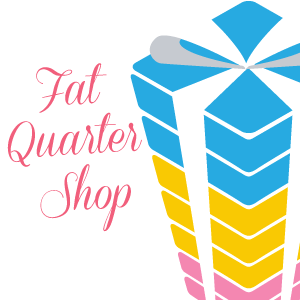 What is it doing coming up in January? Not only that, but the pink bloom was superb, and had the sweetest fragrance! A day later, it was opening up really nicely. But, there was an ice storm in the forecast and I was afraid it would kill not only the flower but the bulb as well. So, I dug it up and put it in a pot inside, adding to my little kitchen garden. I’ll put it back in the flower bed in the spring. It continued to do well, opening up entirely and filling the kitchen and even the den with its sweet scent. 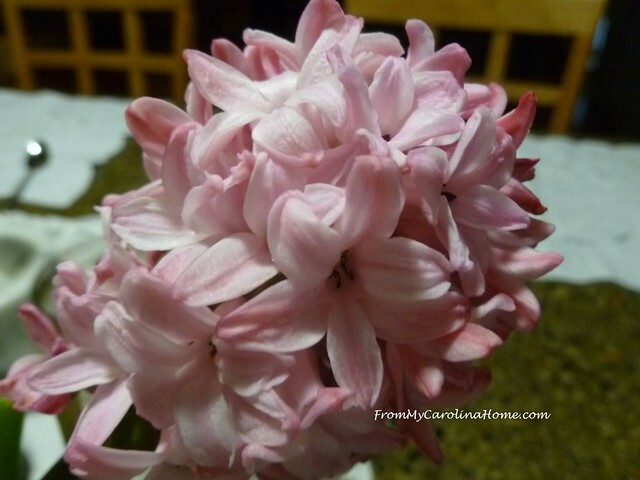 Hyacinths truly do feed the soul. While it bloomed happily inside, the outside went to a winter wonderland. 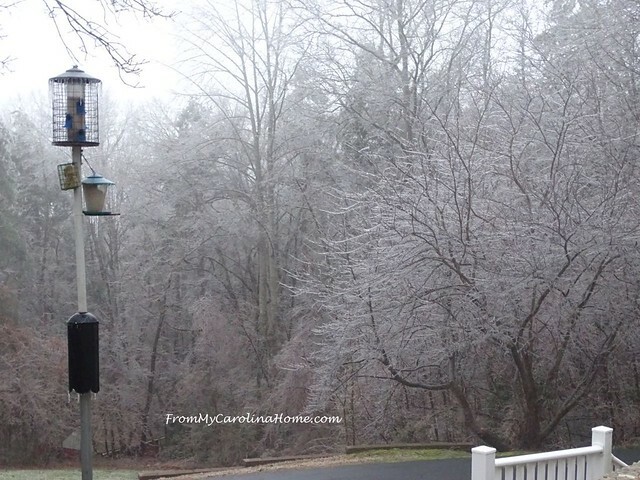 Ice coated the trees and dripped off the bird feeder. DH had just filled it the evening before in preparation for the bad weather. 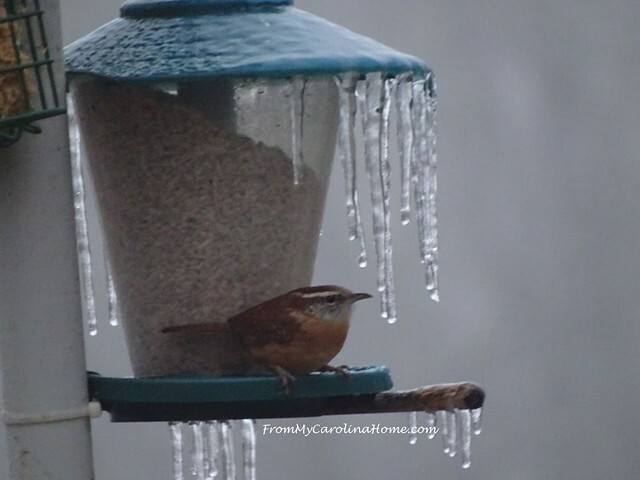 A little Carolina wren maneuvered expertly around the icicles to get a meal. The suet cake was quite popular on this really cold day. Bluebirds, goldfinches, wrens, nuthatches, titmice, cardinals, grosbeaks, towhees and even woodpeckers came by for sustenance. Juncos and doves pecked at the seeds that fell on the ground. DH put some seed for them on the ground too. Squirrels got some of it, but that is OK, they need to eat too. Little birds came and went all day, taking turns and working the seed down significantly. These were the days when we lost power. Beautiful, isn’t it? The ice coating made the forest shimmer with light. But, the weight brought down a lot of branches and some trees, including one down the road that took out our power. Back inside, I decided to take the advice of a reader and root a few of the violet leaves. Flushing the plant did seem to help the stunted growth maybe a bit, the little leaves extended their stems just a bit, and I thought that maybe adding new potting mix would help it recover a bit more. It remains to be seen if this will cure its ailment. I’ll give it a few months, with some time outside this summer before deciding if it is recovered enough to keep it. The two amaryllis bulbs I repotted last month have put up some nice leaves. The Apple Blossom one, now in the silver pot, seems to be putting up a flower stalk just barely peeking up at the base. The beautiful red one is in the Japanese pot, and so far hasn’t shown any flower stalk. I still have hopes for it though. In the Carolina room, our three season porch out back, the geraniums, bidens, and parsley continue to survive. This is the first time I’ve had a chance at overwintering some of my plants. I am particularly pleased that the tall spike dracaena is still doing well. It adds much needed height to the groupings on the veranda in the spring and summer. I am watering only lightly, and just trying to keep them from freezing. They get just a bit of direct sunlight in the late afternoon. I’ve been studying my new Farmer’s Almanac for 2019 to plan my planting and I got a new Gardening Calendar for the kitchen. The full moon on Monday was the Super Blood Wolf Moon, and a rare total lunar eclipse was visible in our area after midnight into the wee hours of Monday morning, but we didn’t stay up to see it. 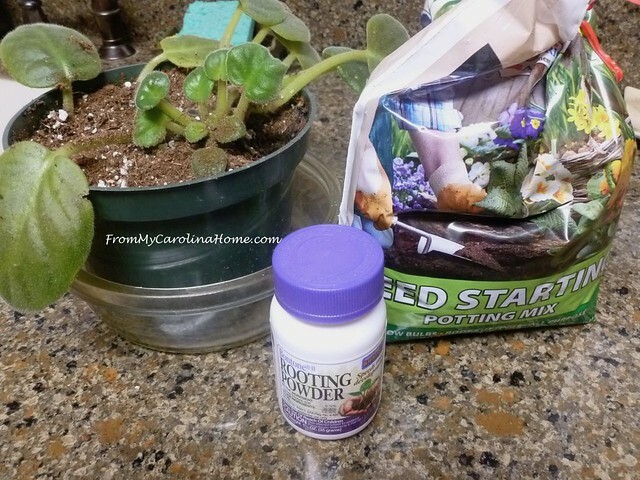 Tomorrow through the 26th is a good time for planting flowers for warmer climates, but wait until the 27th and 28th to start seed beds or repot houseplants. 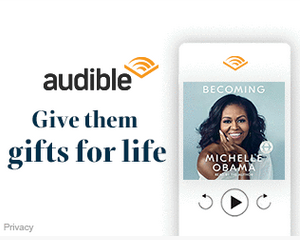 I’ll wait until the end of February to start mine, as I usually begin too soon. It is hard not to get all charged up to plant with the seed catalogs full of inspiration! My garden is under a foot of snow with a layer of ice on top! But I also brought in my rose scented geranium (for the second year), cut it way back, and it has leafed out and looks like it is going to be beautiful again. The rosemary I brought in did not survive–probably my fault for not taking more care in potting it. But a wonderful friend gifted me a very healthy plant at Christmas and it is very healthy. I try every year to bring something in. 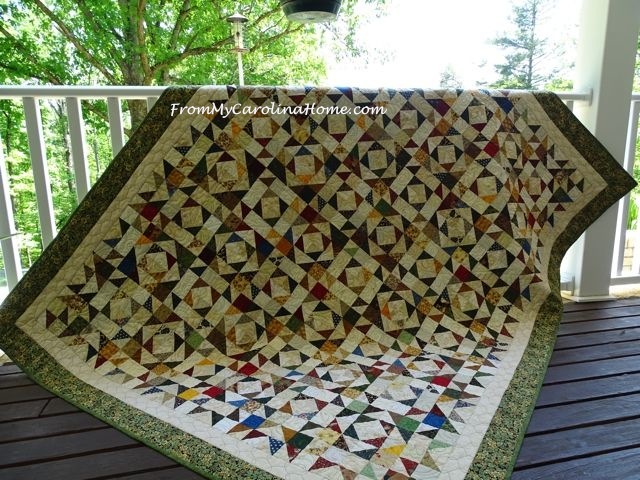 I need a little green in the winter time! Everything outside is frozen mostly, I have started my winter sowing in the milk jug with the cold hardy veggies first and this week I’m starting some hearty perennials hopefully. Annuals will come later. After another five inches of snow last night following the six last weekend and more predicted today I’m glad I filled my feeder on the deck. I won’t be able to get out there to refill until some of this snow is gone. My daughter and her family have a bad round of colds or she would come over to shovel off the deck for me, but I will have to be patient. I’m glad my refrigerator is stocked and I have food for my pups. My amaryllis are still sound asleep in the basement. I will probably bring them up next month when the poinsettia bracts are fading. I re-potted them last summer so now I have five. We will see if they do as well as they have in the past. Two things about all this snow. It is beautiful and it’s a good time to work on my UFOs. Have a wonderful day. I have camilias that bud and bloom all winter. The two large bushes have pink and delicate flowers and reside in a large garden in the back yard. So I can see them all winter. Many years ago I was told by a friend, do not plant them on a hill. I did. I also have winter pansies that are still alive. Your birds and feeders are so nice. I so enjoyed your photos. My outside garden is under snow and ice but the inside bulbs are starting to grow. One of them is showing buds so I can hardly wait. Temps are in the single digits but that’s warmer than in past years. sigh, so beautiful. it’s too dry this winter, coming on top of last year’s mild winter, even yesterday’s blizzard just skirted Denver basin and hit harder to the south and east of us. Makes for better driving on my commute, but not so good for the landscape. The signs are up at all the nurseries to remind people to winter water their trees and lawns once or twice, it’s that dry and no snow on the ground. I didn’t get any paperwhites or hyacinths in the house this year, my lapse! I think I’ll go see what’s at the store, even if short term! I’ve already killed my yearly rosemary plant, and working on the little pine… I can’t resist every christmas, and I can’t seem to keep them alive! Does anyone have clues? the rosemary seems to start to die as soon as I walk in the door with it, I’ve bought from grocery stores and from an expensive nursery, no difference, within a few days it’s going dead from the ground up. I need to do some repotting as well, my jade is taking over its pot, and I inspected my violets to see if mine are doing the same, and they do need something as well. I should have good genes in gardening, my grandmother was known for her beautiful garden, but they skipped me! My spider/airplane plant seems to be doing really good since bringing it indoors this fall. 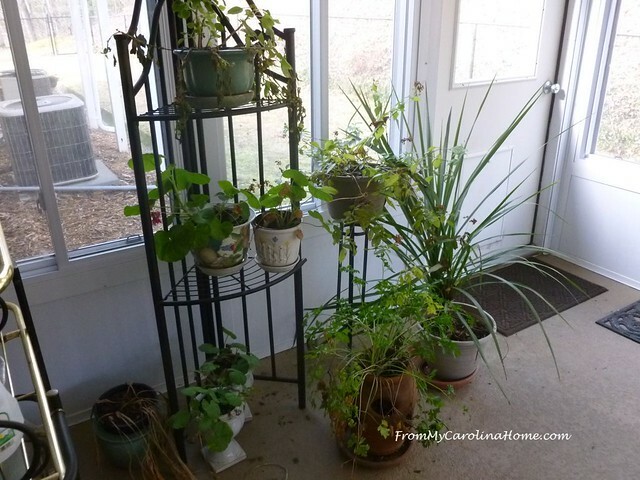 I bring in some of my outdoor plants to overwinter in the basement. Usually works out. I noticed my sage is still alive despite the 8″ of snow followed by rain all last night. I guess you could say we are cultivating quite the mud garden! Lol! I love the winter garden, it has a beauty of its own especially with all the bird visitors. 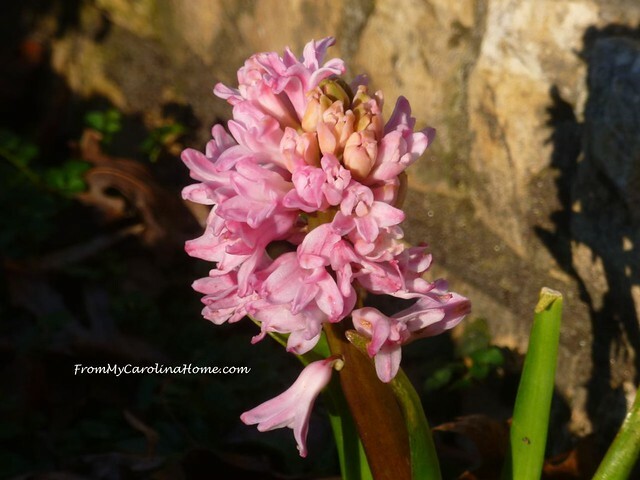 A pink hyacinth in January, wow! Your photos brought great joy to me this morning. Just love your photos of the birds in the backyard. The snowdrops and daffodils are starting to poke up where I live. I love seeing your blog pop up in my e-mail. 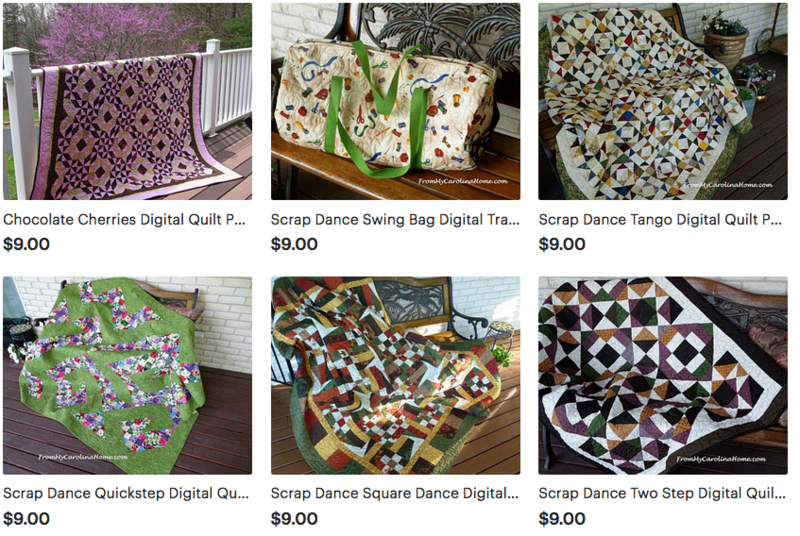 I was born and raised in TN and your blog is so “homey”. Love it. I can just smell those flowers or should I say bulbs. The photos are so welcoming. I especially like the bird photos. I don’t get outdoors as much as I used to do and at my age it’s delightful that you share your world. Thank you so much! In answer to Sharon Schipper, Rosemary is notoriously hard to winter over indoors, especially in heated homes. The environment is just to day. They are a Mediterranean plant and don’t tolerate the soil drying out. I once had a fairly good size rosemary for about 5 years, but the last few years have had no luck keeping them all winter. Best if they are kept in a cool (but above freezing) location with bright light and don’t get the soil get dry. We’re in TX right now visiting family, but when I left NY in mid-Jan, several of my orchids were getting buds. A neighbor comes into to water the plants and we keep the temp at 55 degrees and everything usually survives our absence except if a plant gets left in standing water. Lovely to see your hyacinth. I took a picture of a rose in flower on my walk yesterday and emailed it to some friends up north, telling them no to give up hope. 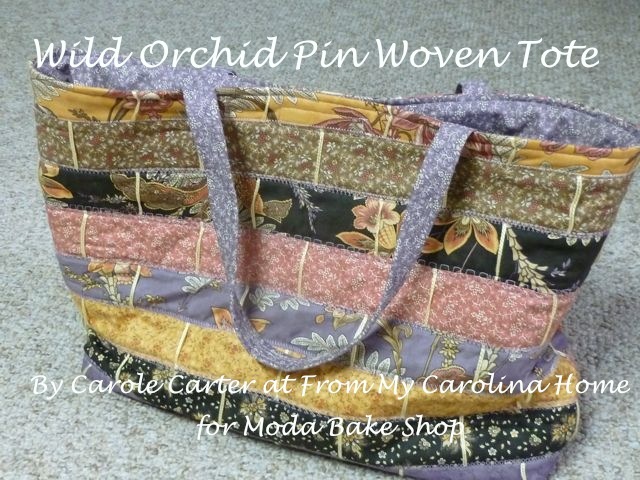 Hello Carole, I enjoy your posts about your flowers, herbs and plants that you share with us. When we move, no idea when or where yet, I should consider an area that could be used as an indoor green house. I know that Kevin and I would both truly enjoy it. The pictures of your birds and the ice photos were so beautiful today. 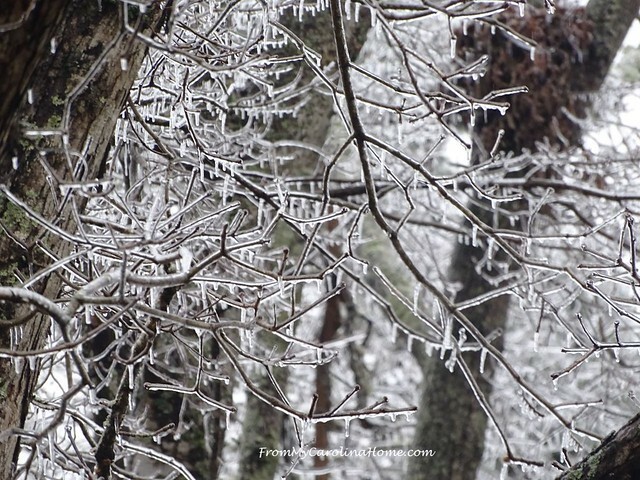 When we lived in Texas, Kevin always talked about waking up to a world of ice but it never occurred while we were there. I am sure living in the Midwest for the first half of my life, I have seen plenty of ice but I truly do not remember any. So these types of pictures, they are so beautiful and always new to me now. Of course, you know I always love your spectacular photos of the natural like the pink morning…I absolutely love that one! Thank You so much for always sharing your part of the world with us! 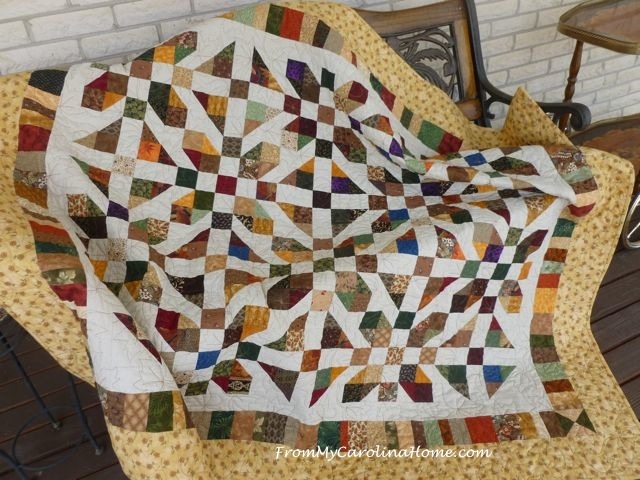 I enjoyed your post very much! Have a great day!! I always enjoy your garden photos. 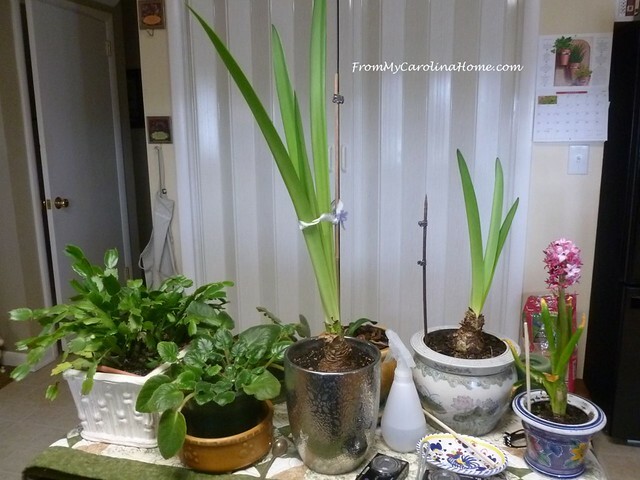 I noticed a couple of my bulbs trying to come up, but nothing like yours that was in flower! Good idea to bring it in! No gardening happening here in Colorado, but we’re definitely enjoying the birds! The goldfinches have discovered our thistle feeder, so we’re seeing them pretty regularly. 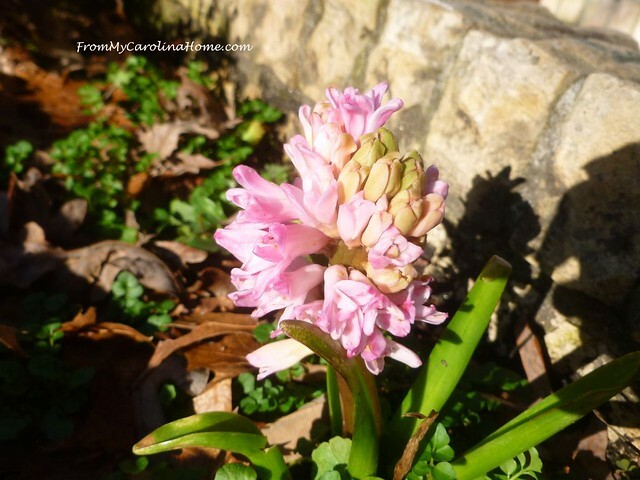 That hyacinth you’ve got is amazing for January! Glad you were able to bring it inside! That sunrise does my heart wonders! The only gardening happening here is dreaming! Yesterday, my garden received some much needed love in the form of leaf raking and a bit of cleanup. Although it was a grey day, the temps were much warmer than the previous week where we struggled to get into the double digits. In my area there are many species of oak trees that continue to shed their leaves throughout the winter – thus the need for continued raking throughout the colder months. A bit each week keeps them under control it seems. One discovery that surprised us was the progress of our daffodils! They must be 6 or 7 inches high with many buds waiting to display their yummy bright yellow! Another honorable mention should go to the moonlit nights we have had very recently – so bright that there are even shadows! Mother Nature continues to keep my attention even in the grey months of the year! From where I’m sitting, that ice looks so pretty. I’m sure in reality, it’s anything but. You must get a lot of pleasure watching all the little birds that come to the feeders. It’s pretty hot here at the moment, so gardening only for a short time in the cool of the mornings. 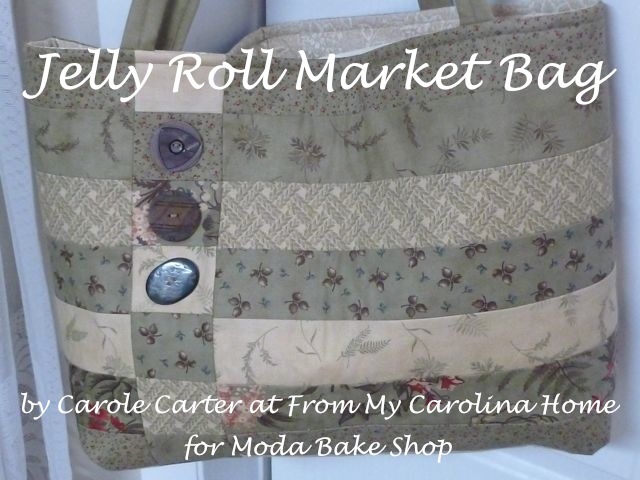 Beautiful photos Carole! 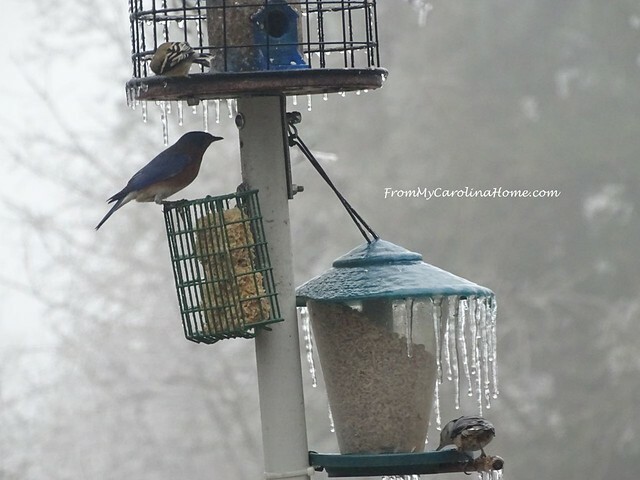 Oh those sweet birds nibbling under the icicles! 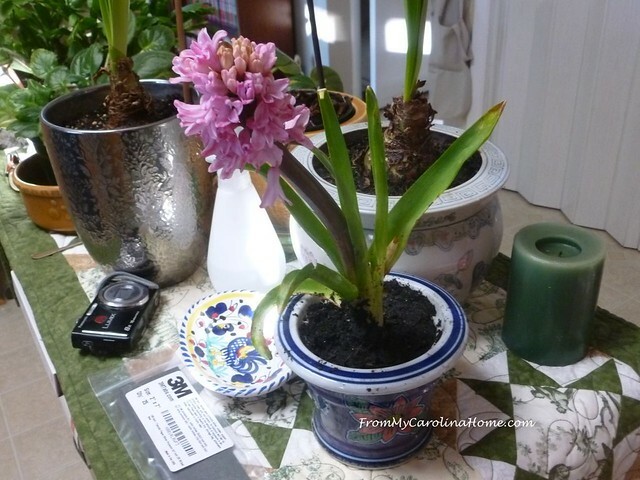 And the hyacinth, what a wonder! So glad you rescued it! That is a fascinating insight into Winter where you live. Love seeing the birds at the feeder.